As a Sister of Humility I am most vocal about the Care of Earth part of our mission statement. I want to shout it from a mountain and make people understand what it is that humans are doing to their bodies, our animal friends, the poor and powerless people, and Earth. There are so many ways we harm our world. At this moment I'm talking about "one use" plastic. Maybe you've heard this before, but we all need to hear it again. and again. and again. and make changes. It may take practice, maybe a little work or investment, but there are relatively simple changes we all can make. I've been so happy to dine at restaurants that don't automatically give me a plastic straw. And they are only too happy to wrap my leftovers in foil, if they don't already provide non-plastic cartons. Normally I have my glass water bottle with me. But I sometimes drink water out of a plastic bottle when there is no other alternative - it makes me cringe a little because I know there is plastic in what I am drinking. Hydrating wins in some cases. But, I ALWAYS recycle the bottle. And at first I'd forget my canvas bags and come home with my purchases in plastic. But now, after practice, I NEVER forget to carry reusable shopping bags. In fact, I have a collection of cute or funny ones that I and others enjoy! What items are we talking about? Bottles, bags, utensils, cups, straws, and packaging. Humans buy 1 million plastic bottles per minute, only about 23% of which are recycled. Approximately 4 trillion plastic bags are used annually worldwide, only 1% of which are recycled. Half a million straws are used in the world EVERY DAY. 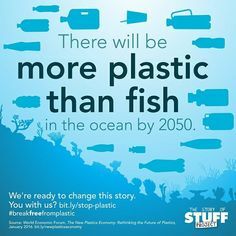 However, the main cause of increased plastic production is packaging. About a third of the 78 million tons of plastic packaging produced annually is left to flow into our oceans, the equivalent of pouring one garbage truck of plastic into the ocean every minute. Even the plastic disposed of in your trash can contribute to pollution, as landfills leak and the wind blows light-weight items away.